NCERT Solutions for class 11 Biology in PDF form free download. On this website, there is no need of login and password for taking the contents. NCERT Books and NCERT Solutions of other subjects of 11th class are given in simplified format. All questions – answers are easy to understand and keep it in PDF file to use offline. Download 11th biology solutions of NCERT books questions in PDF form. NCERT exemplar books (important books for CBSE examination point of view) are also available to download. 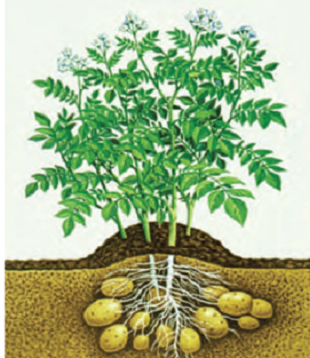 Underground stems occur inside the soil. They are devoid of chlorophyll and generally possess small scaly leaves. They sometimes store food. In favourable season, they produce aerial leaves. They also carry out vegetative propagation. The food stored in them provides nourishment during dormancy period. Under specific condition, the stem performs special functions. Storage of food: Underground stems are modified for storage of food. In Ginger, the underground stem grows parallel to the ground surface and it becomes fleshy through storage of food. In the axils of the underground scaly leaves of Potato plant branches develop. They store food in their apical regions which become round or oval. These are called tubers. Vegetative Propagation: These modifications are of subaerial stems. A part of the stem is underground and a remaining part is above ground. 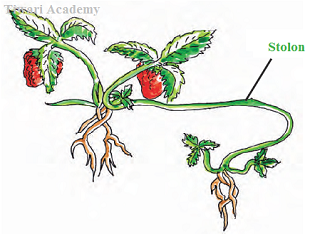 In Nephrolepis and Strawberry, branches arising from basal regions grow obliquely like arches, come in contact with ground and produce new plants. These branches are called stolons. In Mint vegetative propagation takes place by suckers. Protection: In some plants, the apical or the axillary bud develops into a sharp pointed structure. It is called thorn. They are protective. 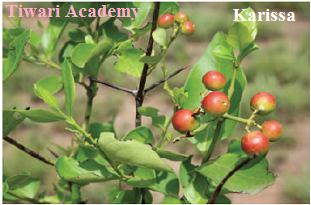 In Carissa, the apical bud is transformed into thorn. Sometimes leaves and flowers are borne on thorns. The pointed, curved sharp structures produced on the surface of stem in rose plant are called prickles. They are modifications of stem. 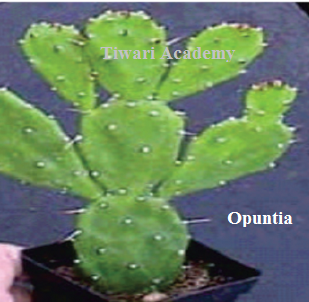 Photosynthesis: Plants like Muehlenbechia and Opuntia live in dry habitats. They shed their leaves to reduce transpiration. Their stems become green, possess chloroplasts and are generally flat. Such stems which carry out photosynthesis are called phylloclades. 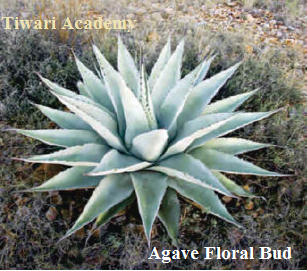 Storage of Food and Reproduction: In Dioscorea and Agave plants, axiliary buds and floral buds respectively store food and become fleshy. Later on they separate from the parental plant and produce new pants. Such a modified fud is called bulbil.